SAN DIEGO – Roughnecks coach Curt Malawsky didn’t mince words. Following a 15-9 loss to the expansion Seals in San Diego, the Riggers bench boss was blunt in his assessment. The Roughnecks trailed 3-2 after the first quarter and 8-5 at the half in a contest where they were forced to play catchup for much of the night. Dane Dobbie and Rhys Duch each scored twice and had five points, while Chris Boushy also tallied a pair and Ryan Martel, Riley Loewen and Curtis Dickson – with his first goal of the season – rounded out the scoring for Calgary. Seals standout rookie Austin Staats had a hat-trick and seven points to pace the homeside. Boushy opened the scoring with a shot from distance that slipped past former Roughneck netminder Frank Scigliano. 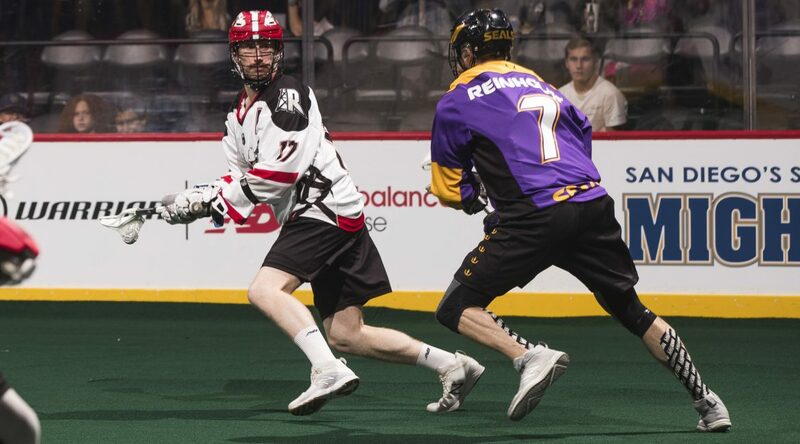 Then Dobbie, the NLL’s leading scorer, netted a powerplay marker to put the Riggers up by a pair early. But Staats scored two goals in under a minute to even the score, with Seals captain Brodie Merrill converting on a short-handed opportunity to give San Diego their first lead of the game. Martel, on a behind-the-back feed from Dobbie, ended the Seals four-goal run with a quick shot past Scigliano as he tip-toed the crease. Duch would tie the game at four, as he snared a rebound and whipped it through Scigliano’s legs with a bouncer. After trading goals back and forth, a trio of late markers by Casey Jackson, Garrett Billings, and Johnny Pearson gave the Seals their halftime cushion. “Going into the half it was close but then they went bang, bang, bang,” said Malawsky. “When we were low, it was real low tonight. Just like the opening half, Calgary was the first to strike in the second half on a snipe from Dobbie. However, the Seals would go on a run and bury the next six goals, extending their lead to eight at the end of the third quarter. Loewen stopped the bleeding by rifling a shot high over the shoulder of Scigliano early in the final frame. The Riggers would score the next two courtesy of Dickson and Duch. But then Adrian Sorichetti potted an empty-netter to put the game out of reach. One positive for the Riggers was their play in the fourth quarter, where they outscored the Seals 3-1. Calgary will be back in action on Sunday in a matinee affair (1 p.m.) against the Colorado Mammoth at the Pepsi Center. Having the quick turnaround presents an opportunity to right the ship.